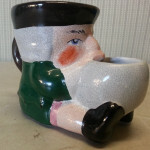 Figural Shaving Mug often referred to as “Toby”. This is a figural mug that can be found with several different colors of coat. The Toby shown here is in relatively poor condition with lots of crazing to the porcelain.